Masterkeying - Reed's Locks and Access Control Systems, Inc.
Why do I need a Master Key System? Masterkeying allows access control of key holders. When properly designed, each person should carry just one key to gain access to all the doors/areas they are allowed to access. To ensure a facility has the desired level of security, it is necessary to have a properly designed and maintained master key system. Reed’s Lock & Access Control Systems offers all of the products and services to help you implement a new master key system, or expand an existing one. Our team of trained key system specialists will help you design a secure master key system, develop and implement key control policies, select the right cylinder/lock for each doorway, and understand the latest trends in physical security. 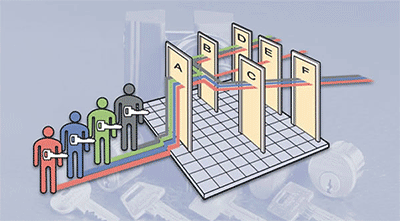 To extend the life and value of a key system, proper key control policies must be in place. Non-duplicable keys and strict duplication policies must be in place. 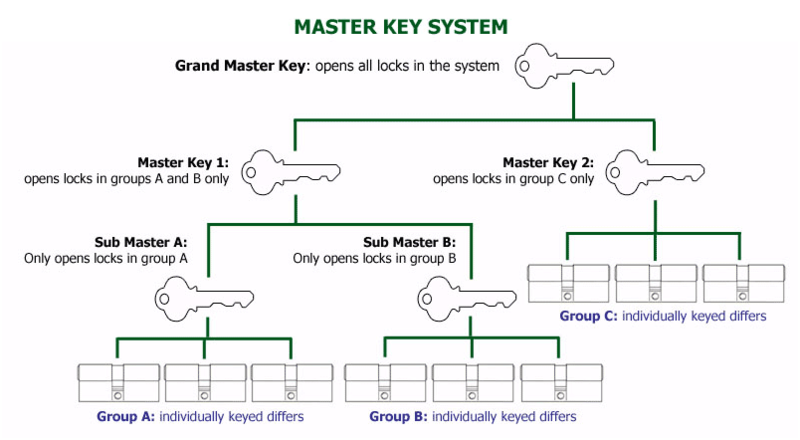 How a typical masterkey system works.